AMAZON Says Happy September With The Tallent & Lowery Series! Happy September from AMAZON Books! For all the readers out there… Looking for Action? Suspense? A Mystery You Can Not Put Down? The series reviewers are raving about, calling it: “Indiana Jones with Heart” – Tallent & Lowery – EXPLODES on Amazon Books. TODAY! September 1, 2015: Jump on Board with the hottest duo in suspense, action and mystery! Follow a path that will take you from The Winchester House to Glastonbury to Whitechapel and BEYOND as beloved characters Gareth Lowery and Leah Tallent walk paths that uncover clues to solve the biggest mystery ever written!! Get Books 1-4: 13, The Sapphire Storm, The Hero’s Companion & The Charlatan’s Crown by Author, Amy Lignor TODAY. And Look for BOOK #5: The Double-Edged Sword Coming at Christmas! Interview With The Fan-Favorite Duo: Tallent & Lowery! Reviews Coming in Strong!!! 5-Star all the way for Book, #4 of Tallent & Lowery! 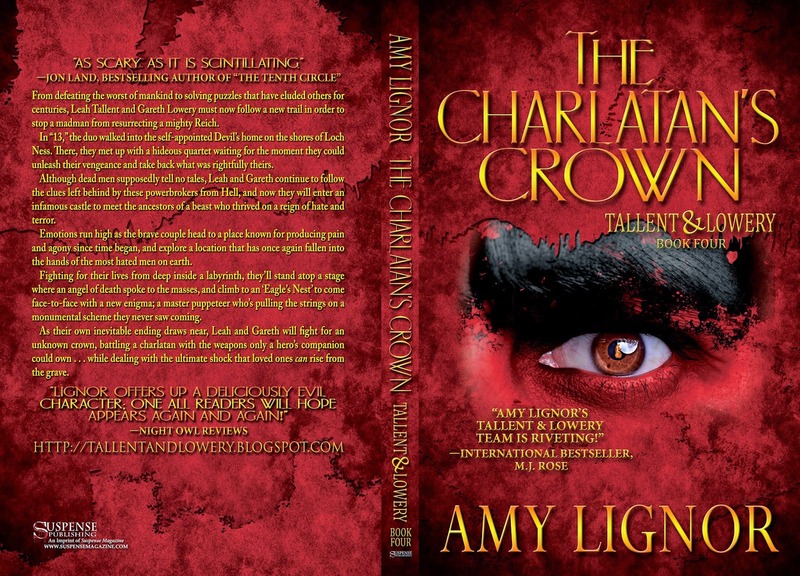 “If you’re looking for a fantastic read, one that will swallow you up and force you to read late into the night, check out The Charlatan’s Crown! …Another fantastic book in the Tallent & Lowery series, one that you do NOT want to miss! Tallent & Lowery Book #4 ARRIVES TODAY!!!! From defeating the worst of mankind to solving puzzles that have eluded others for centuries, Leah Tallent and Gareth Lowery must now follow a new trail in order to stop a madman from resurrecting a mighty Reich. In “13,” the duo walked into the self-appointed Devil’s home on the shores of Loch Ness. There, they met up with a hideous quartet waiting for the moment they could unleash their vengeance and take back what was rightfully theirs. Although dead men supposedly tell no tales, Leah and Gareth continue to follow the clues left behind by these powerbrokers from Hell, and now they will enter an infamous castle to meet the ancestors of a beast who thrived on a reign of hate and terror. Emotions run high as the brave couple head to a place known for producing pain and agony since time began, and explore a location that has once again fallen into the hands of the most hated men on earth. As their own inevitable ending draws near, Leah and Gareth will fight for an unknown crown, battling a charlatan with the weapons only a hero’s companion could own . . . while dealing with the ultimate shock that loved ones can rise from the grave. As the daughter of a career librarian Amy grew up loving books; ‘Patience & Fortitude’ at the NYPL are still her heroes. Beginning in the genre of historical romance with, “The Heart of a Legend,” Amy moved into the YA world where her first team from The Angel Chronicles became a beloved hit. Moving into the action/adventure world with Tallent & Lowery, Amy has created a new, incredibly suspenseful, team that has once again exploded with readers everywhere. Born in Connecticut, Amy is now living in the bright sunshine of Roswell, NM, delving into her next adventure. To learn more about Amy Lignor, check out her website at http://tallentandlowery.blogspot.com. May 29th! 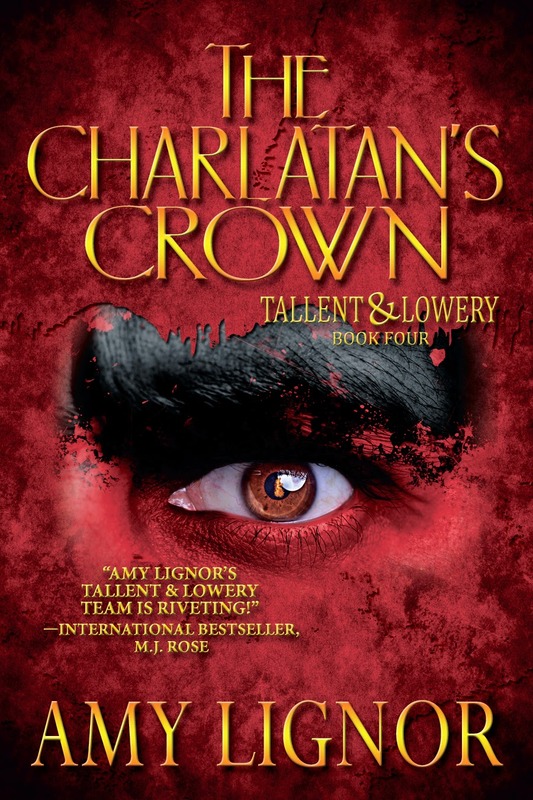 Tallent & Lowery Go on Their Next Adventure in: The Charlatan's Crown! COVER REVEAL! Well, everybody, I just want to say a HUGE thanks to the fans for making this series soar beyond all expectations. You are the greatest! On May 29th, Tallent & Lowery will arrive once again in: The Charlatan's Crown. Check out the cover! In 13, the duo walked into the self-appointed Devil’s home on the shores of Loch Ness. There, they met up with a hideous quartet waiting for the moment they could unleash their vengeance and take back what was rightfully theirs. As their own inevitable ending draws near, Leah and Gareth will fight for an unknown crown, battling a charlatan with the weapons only a hero’s companion could own…while dealing with the ultimate shock that loved ones can rise from the grave. Tallent & Lowery: Modern-Day Shades of the Beloved Miss Bennet & Mr. Darcy! I hope you can all enjoy a small blog about the modern-day adventure couple that fans have stated are ‘bringing back the sparks of Ms. Bennet and Mr. Darcy’! Hope you can join in with the lively discussion! As the daughter of a career librarian I grew up loving books. In fact, Patience And Fortitude at the NYPL are my heroes. Beginning with my first novel, The Heart of a Legend, I moved into the YA world with the bestselling series, The Angel Chronicles. Tallent And Lowery - 13 - is very exciting for me because it was called, “The DaVinci Code With Heart.” Being in the publishing industry as an editor for twenty years, I now own and operate The Write Companion (www.thewritecompanion.com) which offers editing services to authors. I'm a contributor to Suspense Magazine, Authorlink, The Feathered Quill, Random House YA, Ruby For Women, and more. Home to "A Captivating Conundrum"
Best Cover Artist in the Biz!